From engineering to medicine to 3D graphics, Calculus is foundational for all STEM careers. However, Calculus courses today have among the highest failure rates of any course on any campus. According to the Mathematical Association of America, national failure rates within Calculus 1 courses are reaching 38%. By providing students with an opportunity to take a more active role in the learning process, Variant engages and motives students like no other learning tool. 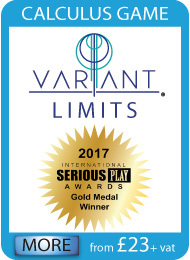 'Variant: Limits' promotes conceptual understanding through direct interaction and immediate feedback in the game environment.